Before leaving Sitka, we take on the fuel. This is our first refuel since we left Port McNeil on Vancouver Island. 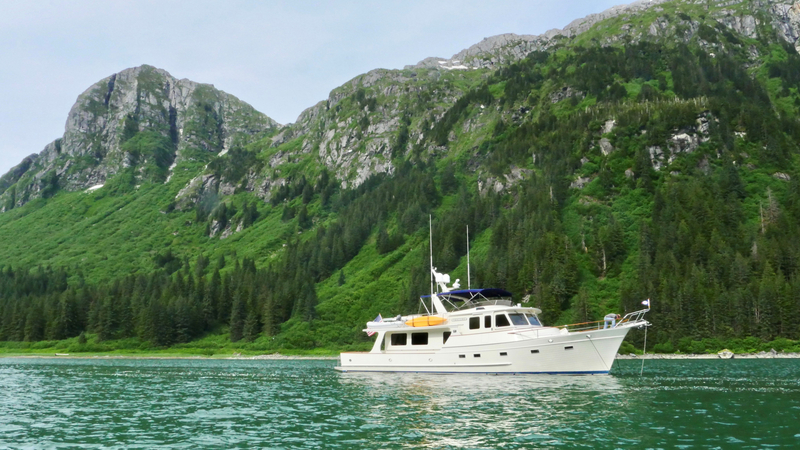 We make our way back through Peril Strait and anchor once again in Appleton Cove at 1712. This time, the bay is filled with crab trap floats. In fact while we are at anchor, an additional three fishing vessels come into the bay casting overboard even more crab traps one of which only a few yards from Venture and very close to where we had dropped our anchor. The morning is misty but much better than forecast. We are underway at 0736 after the delicate task of avoiding picking up the nearby trap with our anchor and wending our way through the maze of floats surrounding us. 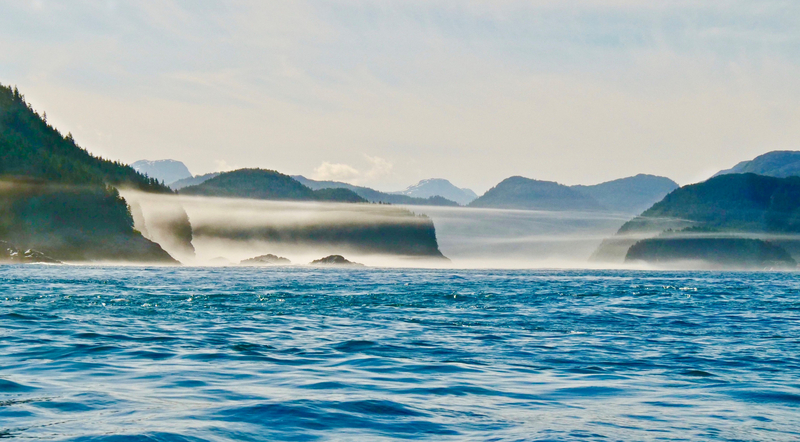 We turn into Tenakee Inlet and approach Crab Bay in the hope of seeing seals hauled out on a spit of land at low tide. There are none to be seen so we do not penetrate into the bay but continue on to Pavlof Harbor where we anchor at 1515. We are enjoying our morning coffee when Chris spots a group of whales at the mouth of the bay. Doc and myself board the large tender and follow them into Freshwater Bay for about two miles. Doc shoots stills while I have an opportunity to video bubble-net feeding. This is not altogether successful as the whales are not releasing visible bubbles prior to surfacing, making it just guesswork where they might erupt en masse from the water. It is sunny where we are but the fog has closed in for our return journey to Venture. We are underway at 0953 heading north. An amazing skein of cloud hangs over the water up eastern side of Chatham Strait. We can see beautiful mountains ahead of us. 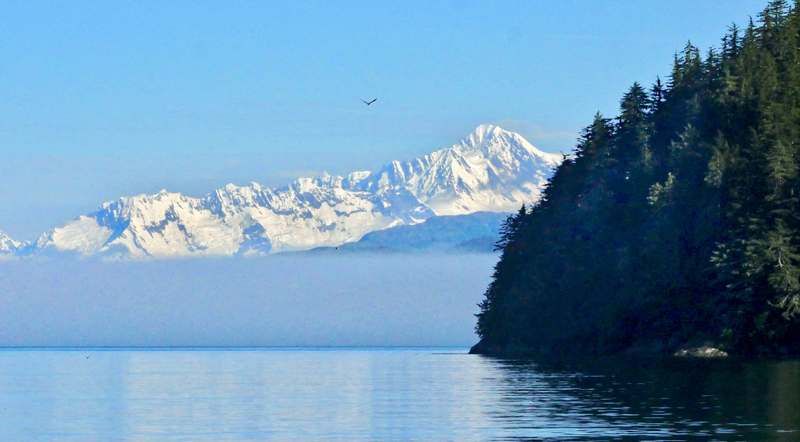 The water in Icy Strait takes on a pale green hue from Glacier Bay. We continue down the Strait to Inian Island where we anchor in Inian Bay at 1711. The water is glassy calm but Venture rocks gently to the ground swell coming in from the nearby ocean. We have up to 24 kts of wind during the night - demonstrating the importance of ensuring the anchor has properly set. We depart at 0837 and head out through the channel leading to the open Gulf. The seas are boisterous in Cross Sound where the powerful outgoing tide meets the incoming ocean waves. Over to port, mist hovers in layers backlit by the sun. 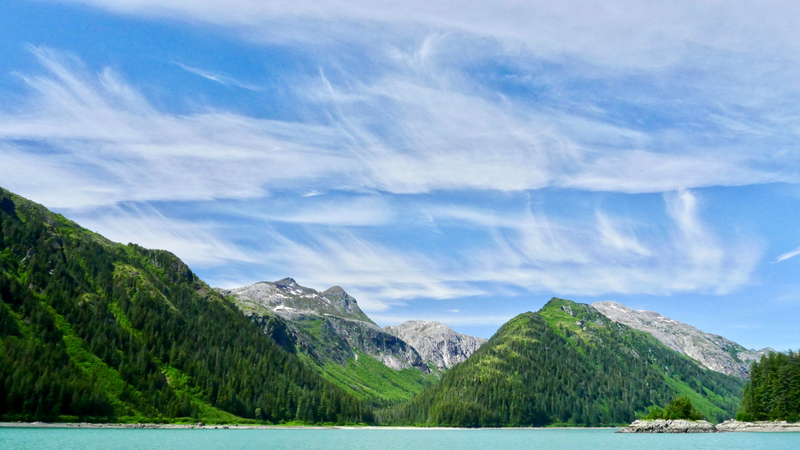 We turn into Dundas inlet on the northern side of the strait and pass a tour boat named Wilderness Adventure with people on shore and in kayaks. We continue to the end of northern arm of Dundas where we see many otters. 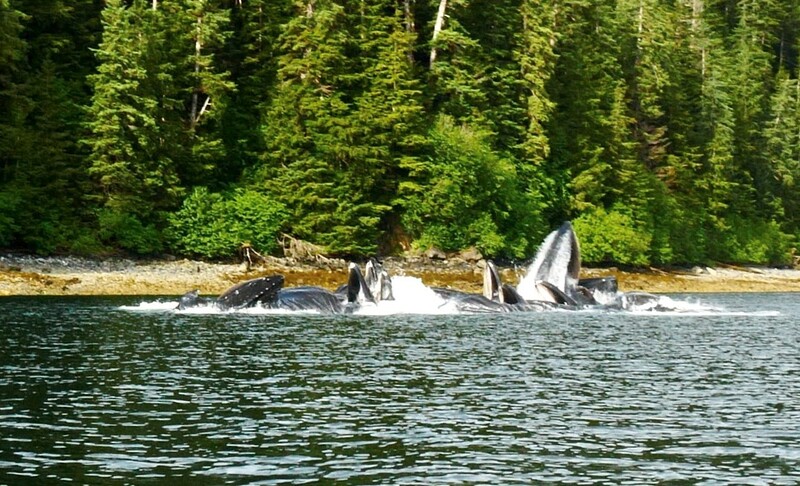 These are mostly females floating on their backs with sizeable young clutched to their bellies. We drop anchor at 1129. Overhead a cerulean sky plays host to a galloping herd of cirrus clouds described as mare’s tails. We decide to spend the day in this lovely anchorage. Today is midsummer day - the longest day of the year. We are underway at 0842. We make for the lighthouse at Cape Spencer which marks the spot where Cross Sound gives way to the exposed Gulf of Alaska. The seas are not too bad as we head up the coast to Mosquito Cove in Graves Harbor. After a brief look-see visit, we reverse course for Elfin Cove but, sadly, there is no space for us so we carry on to Pelican where we arrive at 1607. 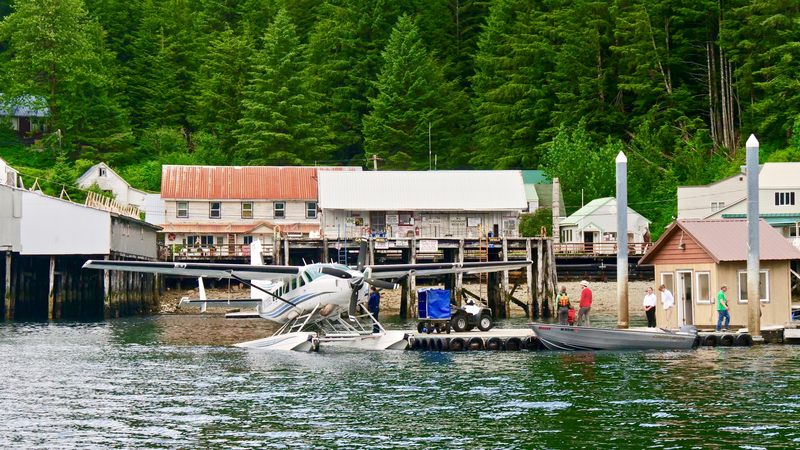 I notice luggage being delivered to floatplane dock so I scoot over there to film the anticipated action. Two Beavers aircraft arrive quickly followed by a Cessna Caravan so things get very busy as people and their luggage come and go. 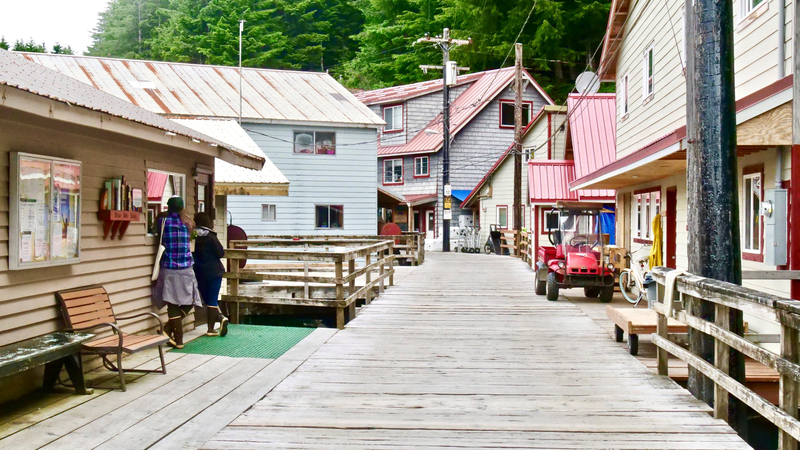 Louisa and I take a stroll along the boardwalk that forms the towns main street. We meet up with local resident Norm and his grandson. He is a retired Alaskan State trooper who studies the history of Pelican. He tells us much of the history of this small town and offers to drop by Venture with a DVD he has put together. We are underway from Pelican at 0840 and turn south to visit the end of the Lisianski Inlet where we are told there are numerous bears. We are surprised to see the number of houses along the shore about three miles south of the town. We spot a total of 14 bears on the way down the inlet, at the end and on the return journey but all are very skittish and beat a retreat as soon as they see us. They are all too far away to be able to photograph them satisfactorily. We reverse course and pass Pelican on our way back to Elfin cove where, this time, we are able to get a berth. Later, a sailboat rafts alongside Venture as space at the dock is limited. There is much activity at the dock when the charter boats return late in the afternoon. 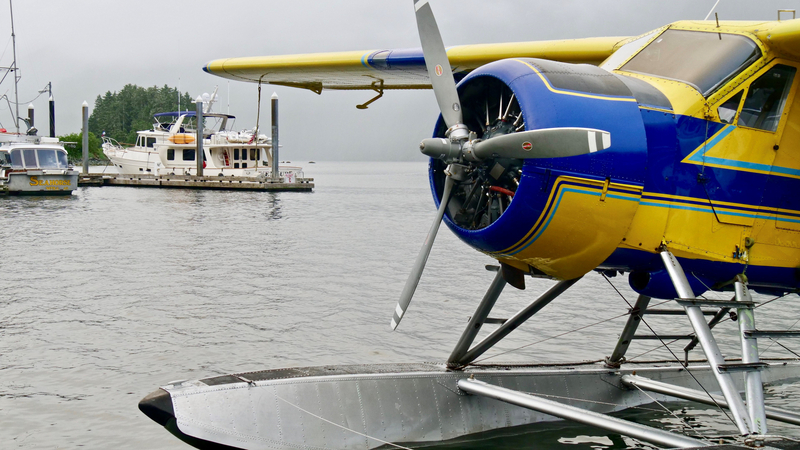 Many float planes come and go bringing in charter boat customers with their luggage and taking away those who are returning home accompanied by boxes of frozen fish. The big ship Pilot vessel joins the crowd at the seaplane dock and offloads the pilots who have just disembarked from a cruise ship and who leave for their next assignment on a floatplane. 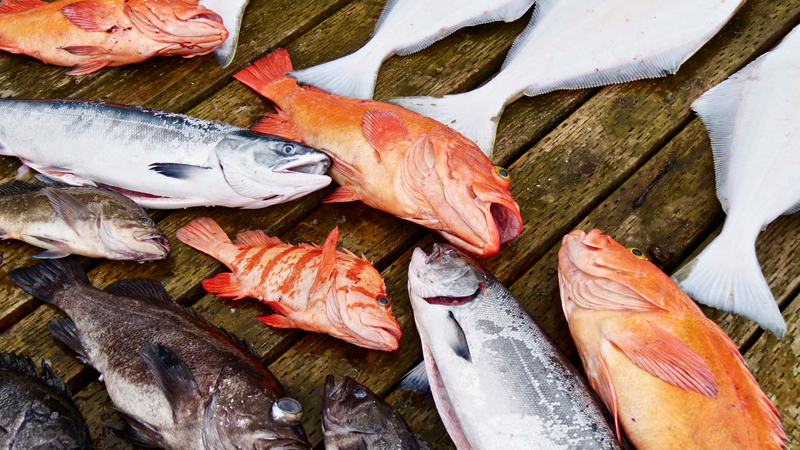 On a small adjacent dock is a different sort of activity where the catch of the day is weighed, sorted and photographed. Skilled knife handlers are kept busy filleting the fish which are mostly halibut, colorful rockfish - including the long-lived Yellow Eye. Elfin Cove has a small restaurant here with a limited menu so we are able to go ashore for our evening meal. We are underway at 0848 and spent the next few hours combing the surrounding waters hoping to see breaching or some other whale activity. 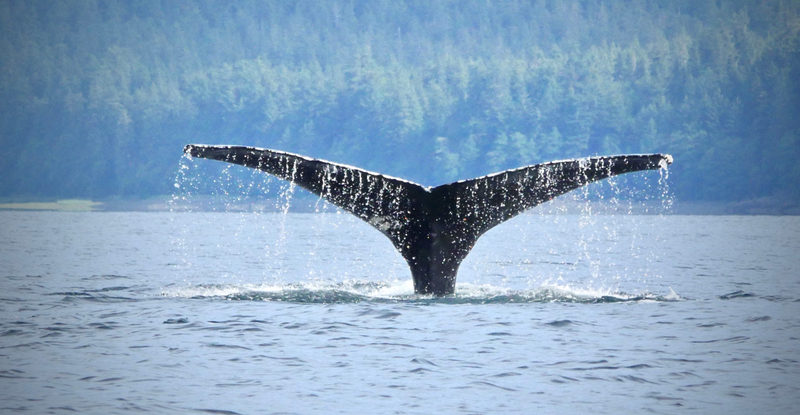 There are plenty of whales around, none of them seem inclined to indulge in the kind of activity we are hoping for. We end up spending the night in back in Inian Bay where we anchored at 1442. 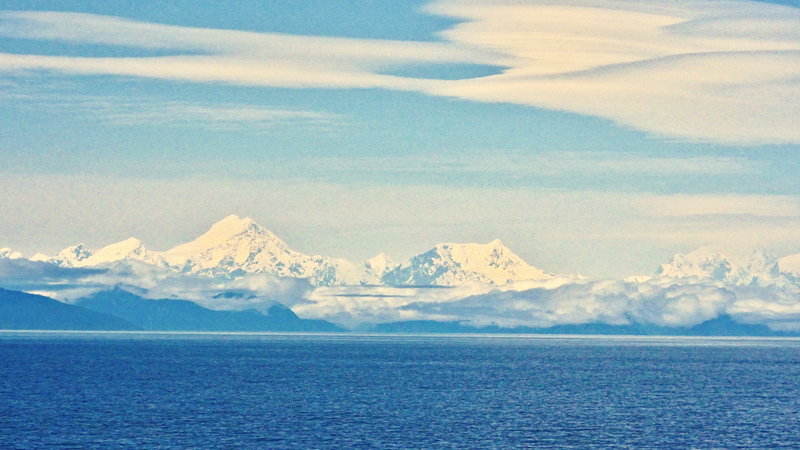 The open mouth of the bay looks across Cross Sound at the tall mountains topped by Mount Fairweather at over 15,000 feet. I sit up until 10.30 in anticipation of a fabulous sunset but no luck. I cook bacon and eggs for breakfast. We are underway at 0837. It is very windy in Icy Strait but it is from aft so we have a comfortable ride. It is a lovely day but the wind has a frigid bite. We stop briefly en route for a couple of whales at Point Adolphus but they are busy feeding and just show us a couple of tails. We tie up back in Hoonah at 1202. Another lovely day at first although rain showers follow. We are underway at 1026 after a quick stop at the local store for perishable items. We head for the Spaski Islands in the unfulfilled hope of seeing puffins. We then move on to Couverden Island where we anchor in 74 ft of water at 1205.